The sign along Interstate 15 on the way to Las Vegas is full of questions. Is it a town, or what? Would it be OK to take the off-ramp and check it out? Well, first off, there is no town. The sole resident of the place between Barstow and the Nevada state line is the Desert Studies Center, a field station operated by a handful of California state universities to teach about and research the local environment. Yes, casual visitors are welcome to drop by, and there’s even a self-guided tour. Zzyzx was named by Curtis Howe Springer, who opened a health spa on the property in the mid-1940s featuring its mineral spring. “The self-proclaimed Methodist minister and physician (he was neither) broadcast daily a folksy, fundamentalist religious program from the radio station he built there asking listeners to send donations for miraculous cures, which were a mix of vegetable juices, shipped throughout the United States and abroad,” the research center’s website says. He wanted to give it a name that sounded like sleep, one that had no vowels, and came up with Zzyzx — “pronounced Zee–zix or Zie–zix, whichever source you read,” the website says. Springer was arrested in 1974 for unauthorized use of federal land and for violation of food and drug laws. The spa was shut down, and two years later the California State University system decided to operate a field station there. The oasis is now managed by the California Desert Studies Consortium, an organization of seven CSU campuses: Dominguez Hills, Fullerton, Long Beach, Los Angeles, Northridge, Pomona and San Bernardino. Drive about five miles south of I-15 on Zzyzx Road and you come to a dozen dull-colored buildings that look more like a desert motel complex than a college campus. Then you see a giant panel of photovoltaic cells, electronic monitors atop a rocky hill, and the big pond with birds, palm trees, and – it turns out – an endangered fish, the Mojave tui chub. The center – on the edge of Soda Dry Lake at the western entrance to the Mojave National Preserve — has a laboratory with microscopes and other equipment, a computer lab and wireless network, a small library, two classrooms, a kitchen, a bathhouse, and dorms that can sleep 75. About 7,000 people a year visit the site in San Bernardino County, according to William Presch, the administrator who is headquartered at Cal State Fullerton. “Students and researchers come in from colleges around the world,” and professionals with the federal Bureau of Land Management, the U.S. Geological Survey, National Park Service, state Department of Fish and Game, and the U.S. Fish and Wildlife Service also visit regularly, he said. “Then we have the casual visitor who drops by off the freeway.” Presch estimated their number at 400 to 500 a year. No camping is allowed on the campus, but there is a way for the general public to stay overnight and get a closer look at what goes on there. They can take one of the extension classes offered by UC Riverside that use the facility. Classes for April and May covered such topics as desert lizards and snakes, spring migration of local birds, the Central Mojave, and earthquakes, volcanoes and ice age lakes. Presch said education is the center’s No. 1 goal and students represent a variety of undergraduate and graduate majors, from biology, geology, geography and space science to anthropology, archaeology and landscape architecture. “Cal Tech brought the Mars Rovers out here before they went to Mars,” and a new species of snail was discovered at the center, Presch said, but a lot of the research is long-term – say 30 years. 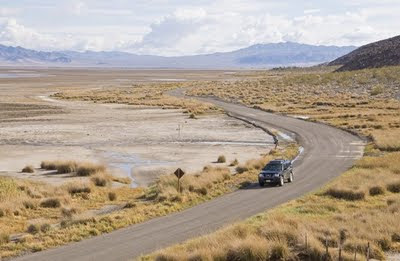 Casual visitors are free to stop for a picnic lunch, walk around campus, or hike and photograph the scenery around Soda Dry Lake, which actually has water in it during wet weather. The arid environment is home to a rich array of animal and plant life, and nearly 200 species of birds have been sighted over the years. Visitors also can see dilapidated buildings that once were part of Curtis Howe Springer’s Mineral Springs and Health Spa. In the winter, the weather can be cold and windy. If you hike when it’s hot, be sure to wear boots and a hat, carry plenty of water, and never hike alone. Water, food, gasoline and lodging are available in the town of Baker a few minutes drive north on I-15, and campsites are nearby. 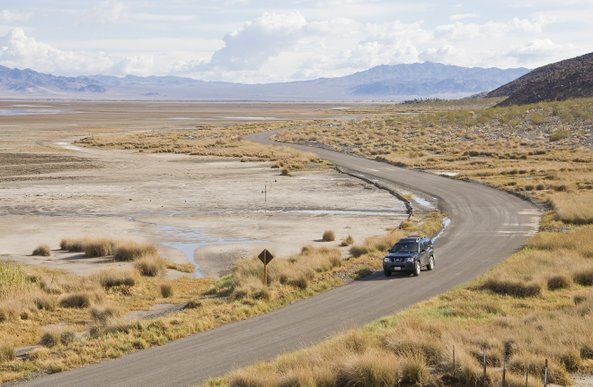 Where: Zzyzx – about 56 miles northeast of Barstow, and 4 to 5 miles south of Interstate 15. Hours: Open daily except Thanksgiving and Christmas from sunup to sundown. Cost: Free for day use.